With General Motors turning 100 this year, the company has looked back over that century of cars, selecting its ten most important vehicles. Including those companies only relatively recently in the fold (like Saab), it makes for a fascinating read. Some of the points are arguable, but on the whole we think that they’re got it right. A little more than a hundred years ago, more cars were powered by electricity than by gasoline. But the internal combustion soon proved more efficient and reliable and electric cars quickly faded way: until GM decided to reinvent the electric car in the 1990s. 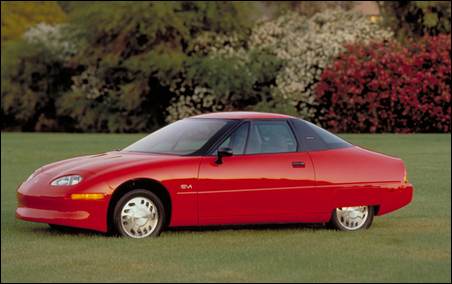 Based on a concept car called Impact, the EV1 was the first modern-era commercial test of the feasibility and appeal of electric vehicles. Powered by batteries that could be recharged overnight in the driver’s home, it produced zero emissions, didn’t even have a tailpipe, and burned no gasoline — didn’t even have a fuel tank. The cars were offered for lease rather than for purchase through select Saturn dealerships in California and Arizona as a test of electric cars’ commercial viability. Just over a thousand EV1s were built but the lessons learned about battery technology and drivers’ reaction to a car with no transmission and no fuel tank were invaluable in pushing the technology envelope to develop other types of alternative propulsion vehicles, including GM’s hybrid lineup and the Chevrolet Volt. The EV1 program ended in 2003, with the car’s cost still high and its demand limited, but one model is now on display at the Smithsonian Institution’s National Museum of American History. High-performance cars have always been cool, but the Pontiac GTO made them cool to a whole new generation and created a whole new market segment. Before the GTO made its debut, “performance cars” were generally full-size cars powered by the largest displacement engines available. The idea behind the 1964 GTO was to put such an engine in a midsize car to deliver even more power and performance. The first GTO was actually a Pontiac Tempest with a standard 389 cubic inch V-8 engine that delivered 325 horsepower. 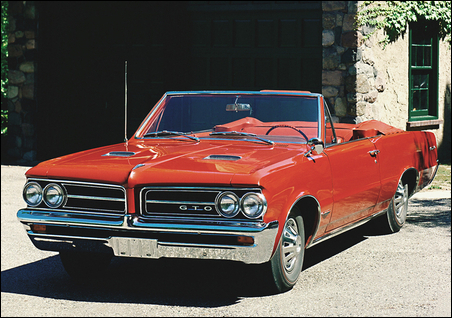 The GTO also featured 14-inch wheels, a firmer suspension, hood scoops, dual exhaust, and sporty trim. It all added up to the birth of what came to be known as the “muscle” car era. Pontiac’s original plan was to build just 5,000 GTOs for the 1964 model year: it ended up selling more than 32,000 that first year alone and many dealers had to put customers on waiting lists. The GTO quickly became a pop legend, featured in films and television action series and in the classic rock song, “Little GTO,” performed by Ronnie & the Daytonas, which sold more than a million records. When you think of milestones of automotive styling, you can’t ignore the curves and fins of the Fabulous Fifties. General Motors set a whole new trend of design in the 1950s — a decade often called “the golden era of automotive styling” — and the rest of the industry followed many of the GM fleet’s styling cues. The car most often identified as an icon of this era is the 1955 Chevrolet Bel Air. Totally re-designed and offered in six body styles with Chevrolet’s first V8 engine option (and with a base price under $2,000), it became the most popular car in America, with more than 760,000 units sold the first year. 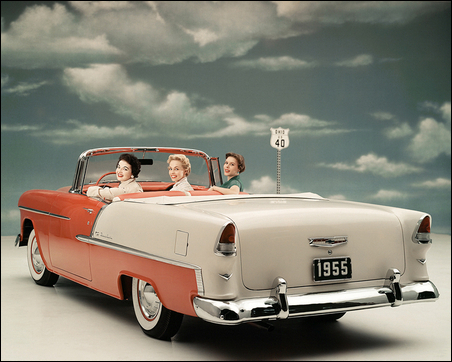 While previous Chevrolets had been associated more with value and reliability than styling and performance, the Bel Air brought a new dimension of excitement to Chevrolet’s image. Its 265 cubic inch V-8 engine delivered 162 horsepower and an option package with dual exhausts increased that still further. Sports cars have always been the stuff of dreams and fantasies, but they were all expensive and hand-built in low volume until GM came up with a different idea. When the first Corvette was revealed to the news media and public at GM’s 1953 Motorama show at New York City’s Waldorf Astoria hotel, most observers thought it was just a “dream” car that would never go into production. Yet just six months later, the first Corvette went on sale, creating an entirely new market segment and a new kind of performance car aficionado. Not only was it the world’s first production sports car: it was the first car with a fiberglass body, which reduced the car’s weight and allowed its designers to make its shape and contour much more daring than possible with traditional steel. The 1953 Corvette featured a 150 horsepower 6-cylinder engine and could accelerate from zero-to-sixty miles per hour in 11 seconds. Just 300 were built that first year, all of them white with red interior, but production increased to 3,640 units the following year and new color and performance options were added. It was the beginning of an American icon. Before the year 1949, the Swedish company Saab had built only airplanes, including jet fighters. 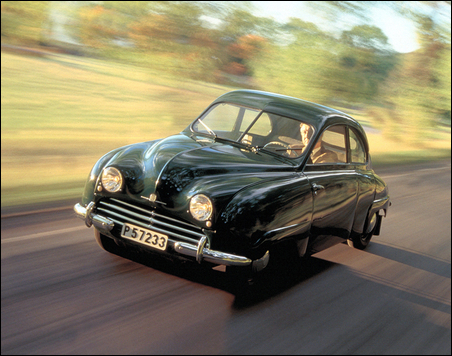 After World War II, the Saab team decided to see how far they could go in applying aeronautical design and engineering to cars. A team of 16 Saab aircraft designers, only one of whom had a driver’s license, worked 4 years on the project, culminating with the launch of the 1950 Saab 02 model. With its streamlined body and a 2-cylinder engine that delivered just 25 horsepower, it immediately became an icon of efficiency and functionality. Initial production was just 4 cars a day and all were the same color — green. Its drag coefficient of 0.35 was the lowest of any production car at that time and lower than that of many cars in production today. Built at a former aircraft plant in Trollhattan, Sweden (where Saab’s headquarters remains today), more than 20,000 Saab 92s were produced between 1949 and 1956, when it was replaced with the Saab 93. If your grandparents compare their first car to those on the road today, one of their first comments will probably be the difference in tightness and smoothness of the ride. The body of that first car was most likely built separately from the chassis and then attached to it, resulting in a much looser-feeling ride than what you drive today. 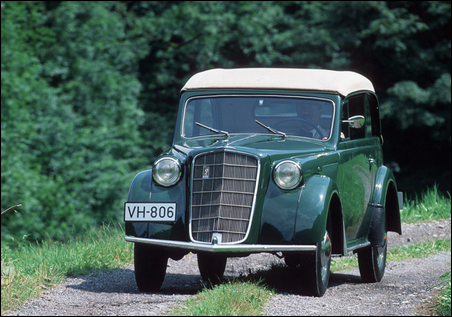 Before the 1936 Olympia’s launch in Germany, virtually all production cars in the world were assembled that way. In contrast, the Olympia’s body and frame were built as a single unit rather than separately. This new process allowed less vehicle weight, better aerodynamics, increased driver and passenger safety, and that tighter ride. Today, virtually all passenger cars are built with this process, known as unibody or unitized assembly. The 1936 Olympia was so named as a tie-in to the 1936 Olympic Games and featured a 4-cylinder 24 horsepower engine with top speed of 60 miles per hour (95 kilometers per hour), which was typical for European small cars of that era. In the late 1920s, there were dozens of large luxury car brands in the U.S., but one car that took the market by surprise ended up spelling doom for most of the competition. 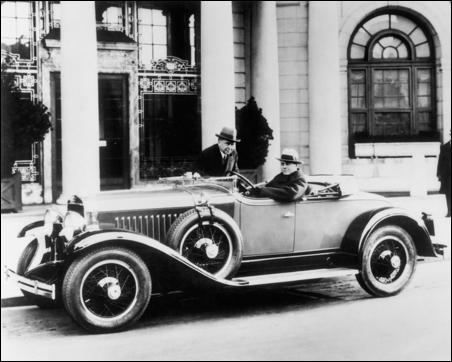 That car was the Cadillac V-16, developed in absolute secrecy and unveiled without advance announcement at the 1930 New York Auto Show. Its unique sixteen-cylinder engine offered more power and smoother acceleration than anything the major U.S. luxury brands could offer and immediately set them scrambling for their own new engine. With the U.S. economy in decline, however, the luxury car market soon shrunk and the competing brands could not come up with the capital for an engine to compete with the V-16. Most of those brands did not survive the Great Depression. Production of the V-16 itself declined after the first year and it was discontinued in 1940 with a total of just over 4,000 units built. However, its impact on the competition and on Cadillac’s image cemented Cadillac’s position as the undisputed luxury car leader and a standard of the world. 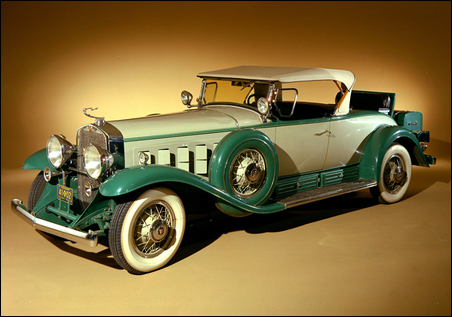 Today, the Cadillac v-16 is highly prized among classic car collectors. Automotive design today is both an art and science, but it was just an afterthought until GM decided to take a gamble on a new approach. 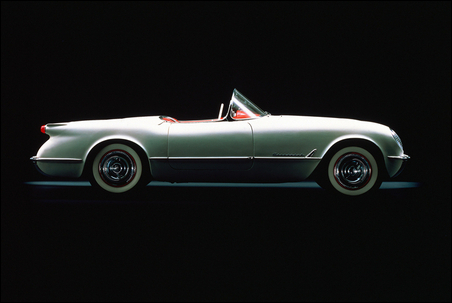 Harley Earl, universally considered the father of automotive design, was customizing cars for Hollywood stars when GM asked him to design a new production car to be called LaSalle: the first time any automaker had turned to a professional designer (rather than in-house draftsmen and engineers) to design a vehicle from the ground-up. With its low profile and curved lines that flowed from front to rear, the LaSalle immediately stood out from other production cars. In 1927, Earl joined GM full-time and created the industry’s first in-house design studio, then called the GM Art and Colour Section, where he was in charge of design of all GM vehicles. The 1927 LaSalle featured a V-8 engine, had a top speed of 95 miles per hour, and was priced between $2,495 to $2,685. The LaSalle line of cars was built and marketed by Cadillac until 1940. LaSalle's success created a change in how automobiles were created which endures today. t all changed with the electric self-starter, invented by Charles “Boss” Kettering at his Dayton Engineering Laboratories Company (DELCO) in 1911. 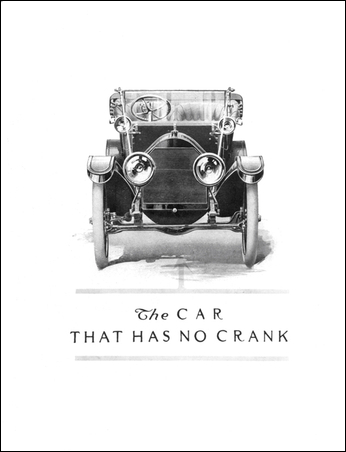 Introduced for the first time on all seven of Cadillac’s 1912 models, it eliminated the cumbersome and dangerous hand-crank and made driving safer, more convenient, and appealing to a broad range of new consumers (including women). In short, it revolutionized the automobile. 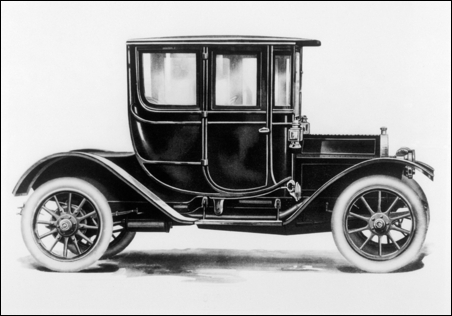 By 1916, the electric self-starter was featured on 98 percent of all cars built in America. The self-starter-equipped 1912 Cadillac lineup won Cadillac its second Dewar Trophy, awarded by the Royal Automobile Club of London, England, for the most important automotive contribution of the year. Kettering went on to sell DELCO to GM founder Billy Durant in 1916 and to join GM in 1918, when DELCO became part of GM. Once you’re in your car, you don’t give any thought to being hit by mud or stones flying up from the road — even if you’re in a roadster. But before the coupe and limousine versions of the Cadillac Model 30 made their debut, most cars on the road had neither a windshield nor even a canvas roof. This car’s closed body was a quantum leap in reducing the discomfort and danger of driving through mud, snow, rain, or dust. Within 10 years, closed bodies were available on virtually all cars and trucks. The 1910 Cadillac Model 30 closed body coupe featured a 4-cylinder engine and delivered 30 horsepower at a price of $1,600. Like most cars of the day, it also came with side oil lamps, a set of tools, a tire repair kit, and one tail lamp.